Well, I suppose he's a part of the Dark Kingdom -- I don't like him much, so this will be short and… sweet? (if you can say that about him…) Never let it be said that I'm discriminatory against any member of the group of villains I'm obsessed with. Don't say it. Even if it's true. Hey, I'm giving him a page, okay? Quit complaining. If you don't like him, hit your back button and go read about Jadeite or Zoisite or someone, unless you're willing to set aside personal preferences to give the kid a chance and to make this page worth the time I spent on it. If you like him, forget all that and read on. All right. Now that we've gotten that straightened out. He's an aberration because he doesn't belong in the Dark Kingdom. 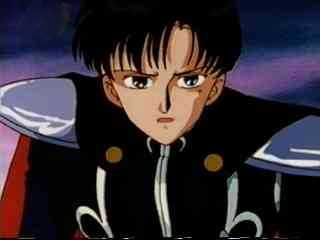 He was the prince of the earth reincarnated in the form of Chiba Mamoru, who would often black out become Tuxedo Kamen when Sailormoon was in trouble. He didn't realize his identity as Tux until he got his first nijizuishou, and he didn't know he was Endymion till the ginzuishou formed in Sailormoon's tear over him after he'd taken an ice crystal in the back. 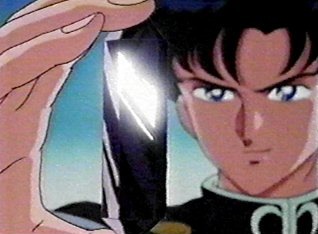 Endymion was originally a nice guy, Princess Serenity's beau and warrior prince in spiffy armor. He died fighting Beryl during the Silver Millenium, but upon his remembrance of his former self in his Mamoru reincarnation, he was kidnapped by Kunzite and given to Metallia and to Beryl herself, then brainwashed into working for the Dark Kingdom. Metallia had some sort of affection for him, though I'm unsure of the specific details (she said his energy resembled her own, but this wasn't really explained), and Beryl obviously held him in a more lascivious sort of esteem. He at first fought the senshi in Tuxedo Kamen form, presumably to psyche them out, though he didn't claim to be Tuxedo Kamen, nor to recognize the name Chiba Mamoru. His roses were black; during the times he'd recover some sort of memory, they'd turn red. He said once that he disliked hurting women, though he would to get the ginzuishou. This is probably why he would always save the girls from Kunzite or from the youma that threatened them, though from the viewpoint of the bad guys (read: Kunzite, as the Queens didn’t seem to care about his actions), he was a pain, pure and simple, and a hindrance to the cause. He and the last living of the Shitennou were not on good terms. They argued a lot about many things: plans, the abilities of the Sailorsenshi, who got what missions, who was favored by Beryl, the fact that she wanted them to work together… whatever. 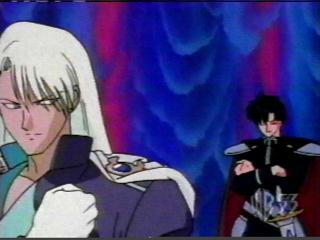 Kunzite was busy mourning Zoisite, who was killed for harming Tuxedo Kamen. He was not a very amiable person to begin with, was hurting from the loss of his lover, and he bore a special grudge toward his brainwashed coworker. And Endymion would go out of his way to bother him. Jerk. Really, these were supposed to be Kunzite's episodes. He'd waited quite patiently for his turn, and did get a brief interlude where he got to work with Zoisite, but since the death of the third king, he had to share his episodes with someone he hated. Endymion. Endymion did get several episodes pretty much to himself. At one point, he got a solo mission, which annoyed the king to no end. This mission was to re-capture the nijizuishou carriers, because somehow Beryl planned to obtain the ginzuishou and revive the seven super youma that once lived in the six humans and one cat. Then she wanted to combine them into some sort of ultimate youma. On his own, Endymion did obtain several of the carriers. 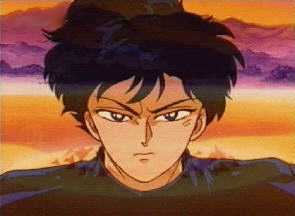 However, he went after Urawa Ryo, the psychic boy enamored of Sailormercury, who saw his coming. The senshi recognized the danger as well, and went to fight him. Some words were said, some punches thrown, some attacks attacked, and in the end, Endymion was healed by the ginzuishou back to plain ol' Mamoru. Then he disappeared, as he was immediately re-captured by the Dark Kingdom. He had to be re-brainwashed from the healing back into the bad, bad Endymion desired by the Queens. This took some time. Therefore, for a few episodes (#42-45), Endymion was nowhere to be seen. In the meantime, Kunzite was killed in battle and the senshi were coming to challenge the Dark Kingdom. By this time, (episode 46), Endymion was brainwashed, and even more under the spell of evil than ever, to the point of mindless servitude. He was like a robot, lacking not only free will but also any rational thought, only able to follow his mistress' orders like a well-programmed slave. 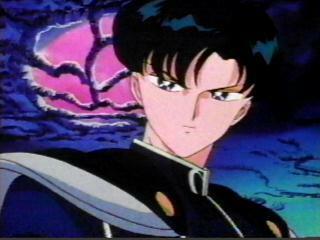 Beryl had him fight Sailormoon, who was at the time horribly distraught at the deaths of all of the other senshi. It was a pretty gruesome battle (Beryl's orders to him were for him to bring her the princess' head! ), and he hurt the girl badly, but in the end, he touched her/their locket, love prevailed, and he regained his memories, turning against Beryl, destroying her attack to spear her in the chest with a red rose. After she retreated, he died, and Sailormoon sobbed over his broken body. Poor thing. It was really sad, I admit it -- she wanted to kiss him goodbye, but wouldn't, because none of the other senshi died before they could kiss their loves goodbye, and... well, it nearly had me in tears. Okay. 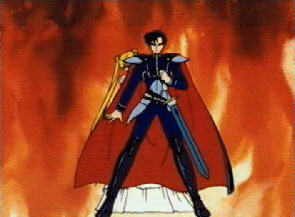 That's Endymion, unwilling warrior of the Dark Kingdom, whom Metallia and Beryl placed their hopes in and lost. En- dee- mee- OH- n. That's the best I can come up with. And it's cute. It's still not a gemstone, though, which gives him yet another reason to be a Dark Kingdom misfit. Well, why should he fit in? He's a brainwashed hero; he shouldn't be completely congruous with the bad guys who are really and truly bad. His armor? It's okay. Pretty cool, actually, though I'm a sucker for a man in uniform, and so vastly prefer the garb of the Shitennou, but I do think that the Endymion outfit is the best-looking of all of his incarnations, though personality wise I would have to prefer regular ol' Mamo-chan. And Kunzite's cape is better. Black and red is everyday. Most cheap magicians have red-and-black capes. How often do you see purple and white? However, the armor on Endymion's shoulders is neat. In my eyes, he'll never even be close to the kings. I mean, look at his hair, for crying out loud. Bor-ing! Short, black, stringy. Not even close to the elegance seen in the glorious, voluminous manes of the Shitennou! Ha ha ha. Oops… wasn't this supposed to be a shrine? Oh, well. All my shrines are basically profiles mixed with my own opinions on the character, and I did just that here.